Now days we are much more curious about Mars rather than our own Planet ” The Earth”. Most of the places on our planet has already been discovered and documented, but there are plenty of places which are unseen and yet to be well documented. Let’s put all these facts aside and Talk about 20 Most Unbelievable Places on this Earth. All these photographs have been captured by various photographers around the world and which may put you in a doubt that these places actually exist.. 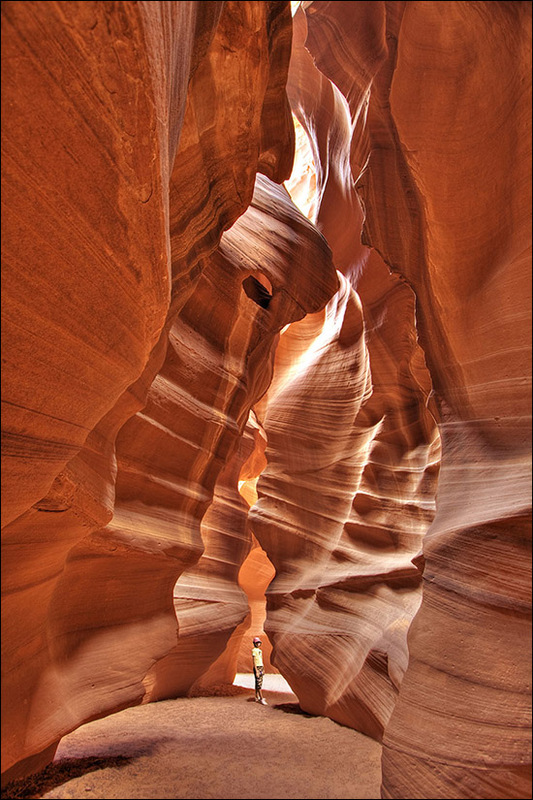 Possibly the most-visited and most-photographed slot canyon in the American Southwest, Antelope Canyon is located on Navajo land near Page, Arizona. Rainwater, especially during monsoon season, runs into the extensive basin above the slot canyon sections, picking up speed and sand as it rushes into the narrow passageways making it one of the most photogenic scenarios. 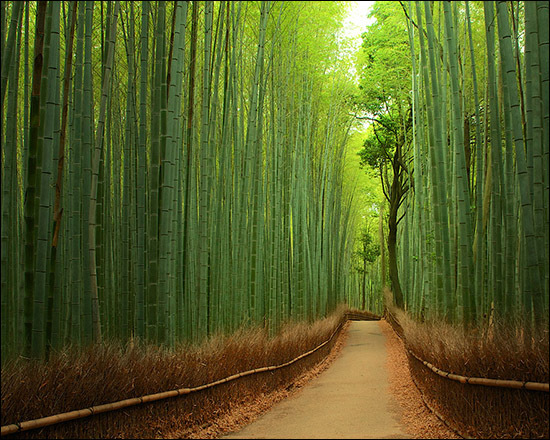 The Sagano Bamboo Forest is located to the northwest in Kyoto Basin, Japan, covering an area of 16 square kilometers. It is one of the most beautiful natural environment in entire Japan, not only because of its natural beauty but also because of the sound the wind makes as it blows through the thick bamboo grove. The Black Forest is not only one of the most varied, but also one of the biggest and best known holiday regions in Germany. The site is more than 200km long and 60 km wide. The dense growth of conifers in the forest blocks out most of the light inside the forest.The Black Forest is the birthplace of skiing in central Europe, with the first ski club being founded at the Feldberg Mountain that rises to a height of 1,493 meters. It was here that the first wooden skis were produced and the first ski lift built. Today, the Feldberg region is one of the largest ski resorts outside of the Alps. 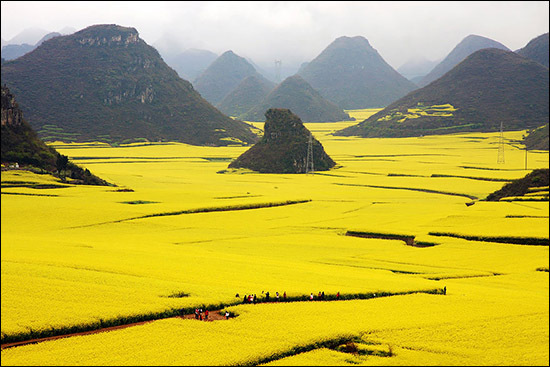 The canola flower fields in China are one of the world’s beautiful sites in small Luoping (Yunnan, China). Vast farmlands get covered in golden, yellow rapeseed flowers stretching as far as the eyes can see, all the way to the horizon. Luoping County in the east part of Yunnan Province is one of China’s primary canola production bases, as well as a base or bee raising and honey collection. Where there are canola flowers, there are bound to be bees. Bees in the area live on the canola flower pollen and see to it that each year has a good harvest. The best time to visit Luoping for this visual fiesta is February through March, by June the show is over. Mount Roraima (mountain, South America) giant flat-topped mountain, or mesa, in the Pakaraima, the 31 square kilometer summit area of Mount Roraima is defined by 400 meter tall cliffs on all sides and includes at the point where the boundaries of Brazil, Venezuela, and Guyana meet. The tabletop mountains of the Pakaraima are considered some of the oldest geological formations on Earth, dating back to some two billion years ago. The result is the staggering landscape of Mount Roraima. 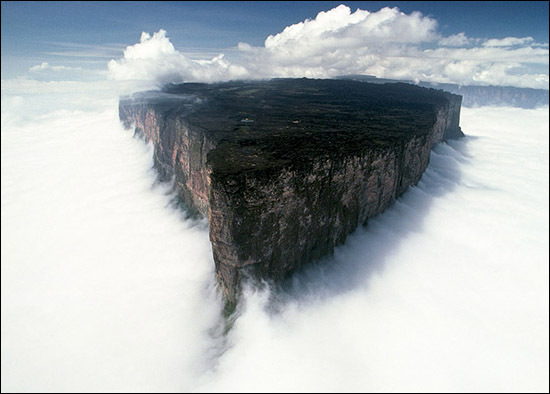 Angel falls is located on a similar tabletop mountain some 130 miles away. 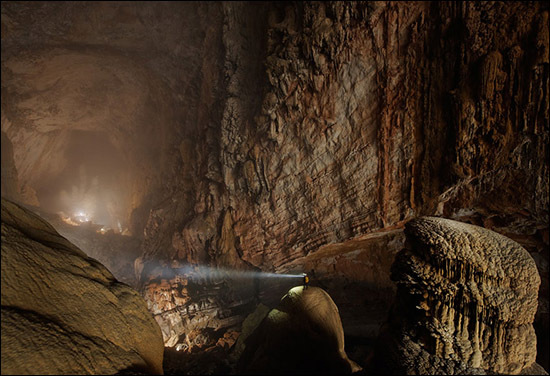 The cave is located near the Laos-Vietnam border. The cave has an underground river running through the first 1.6 miles (2.5 kilometers) of the limestone cavern, as well as giant stalagmites more than 230 feet (70 meters) high. At 262-by-262 feet (80-by-80 meters) in most places, the Son Doong cave beats out the previous world-record holder, Deer Cave in the Malaysian section of the island of Borneo. Deer Cave is no less than 300-by-300 feet (91-by-91 meters), but it’s only about a mile (1.6 kilometers) long. 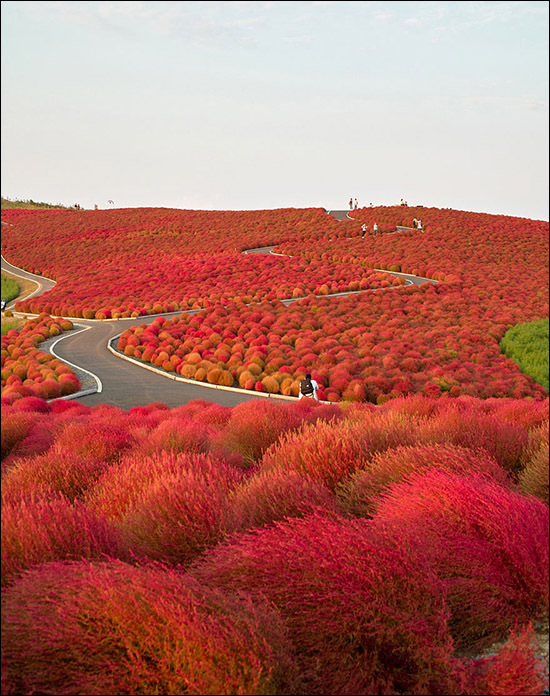 Hitachi Seaside Park in Japan, next to the Ajigaura Beach, is a flower park and a popular tourist destination. The park covers an area of 3.5 hectares and the flowers are amazing all year round. The park is best known for its seasonal flowers- Daffodils and Tulips in spring, Nemophilia and Rose in early summer and Kochia and cosmos in autumn. 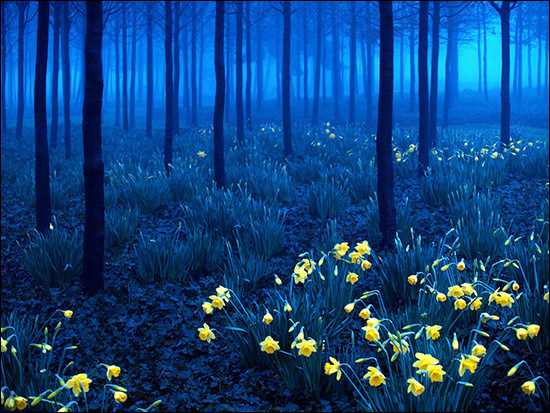 The blooming period is called “Nemophilia Harmony” and is a sight to relish, about a million daffodils (narcissus) bloom in the Suisen garden amidst pine trees. 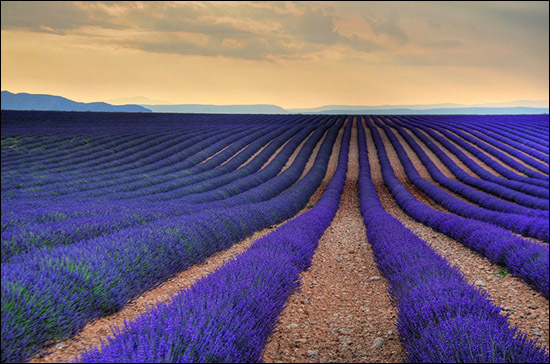 Lavender Fields are a sight not to be missed, the color, the texture, and the scent of a lavender field encapsulate for many the essence of Provence. Lavender is said to heal insect bites and burns as well as repel insects. It can soothe headaches if you apply it to the temples and it helps you sleep if you have the flowers by your pillow. Late June through July is the best season for lavender in Provence. Salar de Uyuni is a salt flat located in the southwest Bolivia. Salar is a Spanish word translating into “salt flat,” and Uyuni is Spanish for “enclosure.” As part of the Andes, the Salar is located at 11,995 feet (3,656 m) above sea level. Salar de Uyuni is the largest salt flat in the world accounting for 4,086 square miles (10,582 sq km). The crust is comprised of salt and covers a sea of brine that ranges from 7 to 66 feet (2 to 20 m) deep. 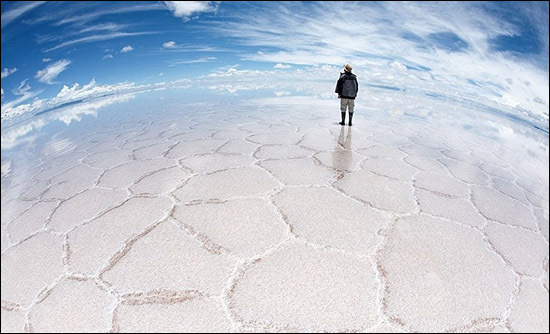 Collectively, the Salar de Uyuni accounts for between 50 to 70% of the world’s lithium reserves. 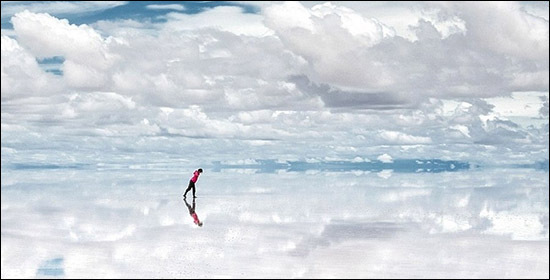 The absolutely breathtaking walking on water illusion is something that is very unique to the salt flats found in Salar De Uyuni, Bolivia. Giant trees surround this old train tunnel located in Klevan, Ukraine. 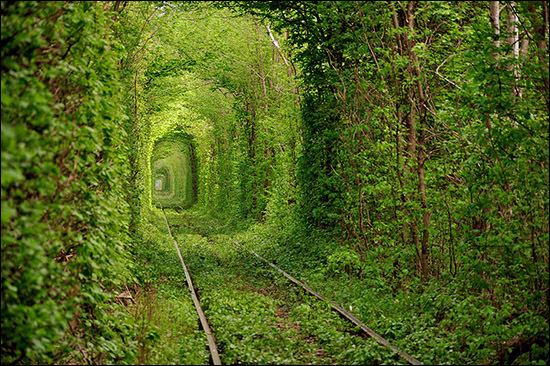 The magical-looking place is nicknamed “The Tunnel of Love” by locals because it is a popular spot for couples to visit.The beautiful train track is naturally covered by green trees and makes a tunnel. It was part of Poland between WWI and WWII. This was an industrial track (apparently for a steel mill) and won’t show on any map view, satellite is needed. Kindly add your reviews about this post, part 2 will be published soon.. Previous article A 70-Year-Old Looks Like a 30-Year-Old. Credits To Home-Grown Vegetables And Rainwater. Next article Taisia Sidorova, Develops Artistic Talent After Losing Half Of Brain. A 70-Year-Old Looks Like a 30-Year-Old. Credits To Home-Grown Vegetables And Rainwater.